The Greater Southeast Asia Gamer Segmentation Study provides the first comprehensive look at who Chinese gamers really are. 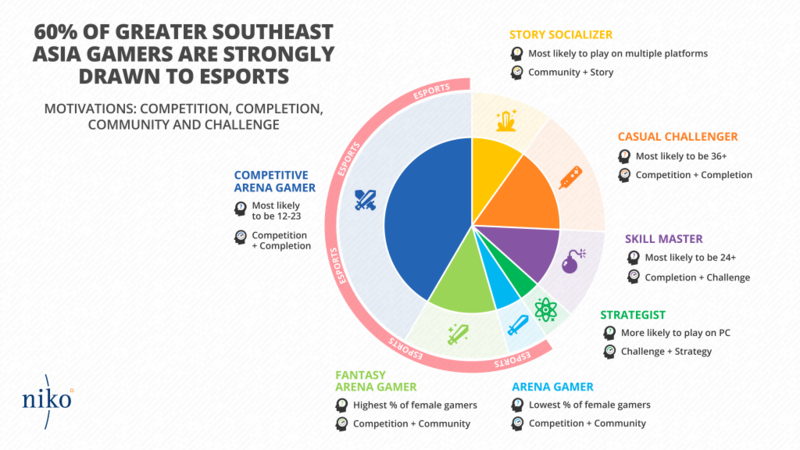 The report provides a comprehensive look at who gamers in the Greater Southeast Asia region really are, and the gamer motivations driving the region’s major trends, such as esports. Greater Southeast Asia in this report includes Indonesia, Malaysia, Philippines, Singapore, Thailand, Vietnam and China Taiwan. Why gamers play is as important as what they play and how much, and is critical to understanding them as gamers — and as consumers. Understanding how gaming preferences, motivations, and demographic variables group together enables targeting those segments with more precise marketing messages and acquisition channels. Fine-tuning player targeting is all the more important in the increasingly competitive gaming landscape. This report brings together our expertise built on 17 years of analysis in the Asia games market with study partner Quantic Foundry’s Gamer Motivation Model and data science methods to produce a first-of-its-kind, in-depth study into the motivations and behaviors of gamers in GSEA. The study also resulted in proof that esports is not a bubble in GSEA . Arena Gamers, Fantasy Arena Gamers, and Competitive Arena Gamers are the key segments for esports. The highest spending gamer segment, Competitive Arena Gamers are also the the most important segment for esports, and the largest segment in the survey. The vast majority of gamers across the GSEA countries engage with esports. Cybercafe usage is an accurate barometer of spending on games.